161,997 new cars registered in July as market declines -9.3% Ã¢ÂÂ the fourth consecutive monthly fall this year. New record market share for alternatively fuelled vehicles at 5.5% as demand surges 64.9% with 8,871 units registered. The UK new car market declined -9.3% in July, according to figures published today by SMMT, the fourth consecutive monthly fall. 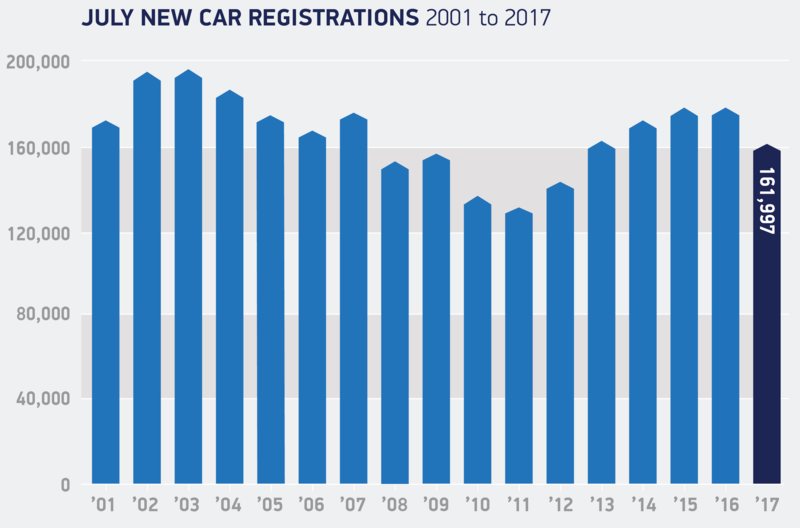 161,997 new cars were registered in the month as the market continues to fall amidst growing uncertainty over Brexit and in line with forecasts. Demand was down across business, fleet and private buyers Ã¢ÂÂ with corresponding falls of -23.8%, -10.1% and -6.8%. Elsewhere, in the month more buyers opted for dual purpose and specialist sports cars Ã¢ÂÂ the only two vehicle segments to enjoy growth of 7.3% and 10.3% respectively. The demand for alternatively fuelled vehicles (AFVs) soared 64.9% as consumers continue to invest in the latest low-emission fuel technology. AFVs took a new record 5.5% market share1ÃÂ in July, as 8,871 new units were driven off forecourts. Nearly 70,000 new AFVsÃÂ have joined UK roads this year. Meanwhile registrations for new petrol and diesel cars declined by -3.0% and -20.1% respectively. Months of speculation about government policies on diesels has inevitably led to a softening of demand and slowed the market shift to the latest cleaner Euro 6 diesels which are valued by consumers for their fuel efficiency and lower CO2 emissions. So far the year-to-date overall performance remains at a high level thanks to a strong first quarter Ã¢ÂÂ with more than 1.5 million new cars registered on UK roads since January. The fall in consumer and business confidence is having a knock on effect on demand in the new car market and government must act quickly to provide concrete plans regarding Brexit.ÃÂ While itâs encouraging to see record achievements for alternatively fuelled vehicles, consumers considering other fuel types will have undoubtedly been affected by the uncertainty surroundingÃÂ the governmentâs clean air plans.ÃÂ It is important to remember that there are no plans to charge drivers using the latest Euro 6 models and no proposed bans for conventional petrol and diesel vehicles for some 23 years. The lower demand in recent months will inevitably mean competition from manufacturers will intensify and it will be a good opportunity for consumers to get a great deal on their next car, with many exciting new models launched in the coming months. Download the press release and breakdown by brand for July 2017.